The Ronald Stevenson Recital was established in 2015 with funds generously donated by the Stevenson society. 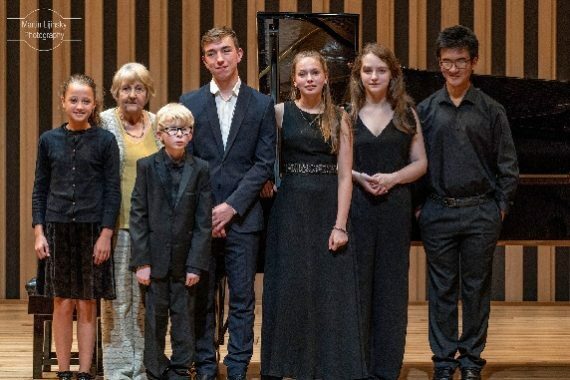 This year we welcome pupils from Chetham’s School of Music to perform a varied selection of Ronald’s piano music. With his trim goatee beard, theatrical coat and broad-brimmed fedora-style hat, Stevenson came as close as he could (though never perhaps quite close enough) to being a sort of Busoni-like figure himself, or at least the very model of a romantic composer of the Busoni period. In his thirties, he was capable of attracting anyone’s attention as he strolled around Edinburgh, holding forth to whoever was with him about Bernard van Dieren, Peter Warlock, the Peebles-born Cecil Gray and other sacred monsters of the early 20th century with whose music he seemed obsessed. As a pupil of the Russian pianist Iso Elinson (who was a pupil of Felix Blumenfeld, who was a pupil of Rimsky-Korsakov) he possessed a keyboard virtuosity more than sufficient to make him an imposing public performer, although he held back from ever becoming a full-time pianist. £5.45 for students and under 19s.